I’m probably not alone in describing the 2012 ARRL June VHF QSO Party as “Wow!” A spectacular 6 meter opening catalyzed some serious fun. My own participation was as a 4-band Limited Rover. Again, this year, I did some of the contest out of an airplane and some out of a car. 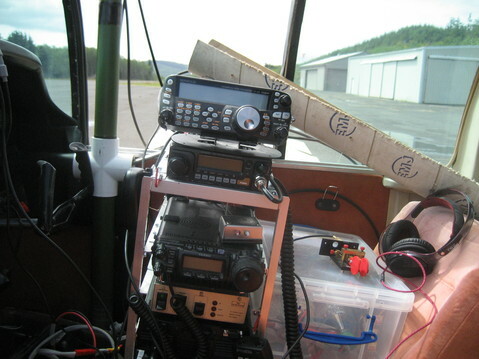 Just a year before, during the 2011 June contest, I had my first adventure as a rover in a VHF contest. I had purchased a Yaesu FT-857 in early 2011 with roving in mind. 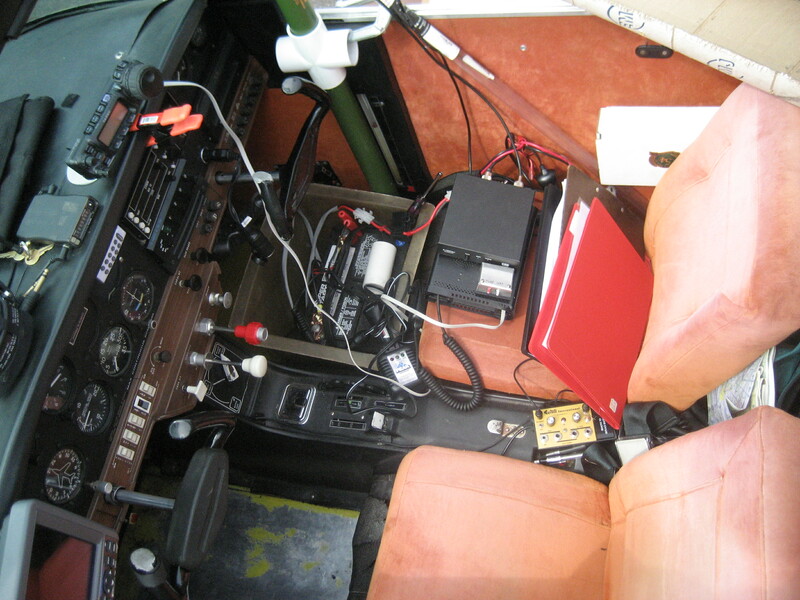 But more than just rove, I wanted to combine my passion for aviation with ham radio for some interesting new challenges. I did pretty well in 2011, activating eight grids, contacting 35 grids, and making about 112 QSOs. I went into the 2012 contest hoping to do even better. Over the past year, I’ve learned a lot about aero/auto roving from several VHF+ contests, as well as the Fall and Spring VHF+ sprints. An important lesson was that some grids are best activated by car. This includes the grids around the Seattle metropolitan area: CN86, CN87, CN88, CN96, CN97, and CN98. Airports are typically located in low, flat areas with poor propagation prospects, so grids that are easily accessible by car are probably best activated by car. And with the Cascade Mountains and their foothills to the east, there are some great elevated locations accessible by car. For example, the Monroe airport is a handy location from which to activate CN97—in fact, I did this in 2011. But the airport is in a hole at 50′ MSL and surrounded by higher terrain. For the same ~15 minutes of travel time, I can go to the CN87/CN97 border near my house at 600′ and have much better success working stations around the Puget Sound area. Another more dramatic example is CN98. In 2011 I activated this grid from the Darrington, WA, airport at 553′ MSL. 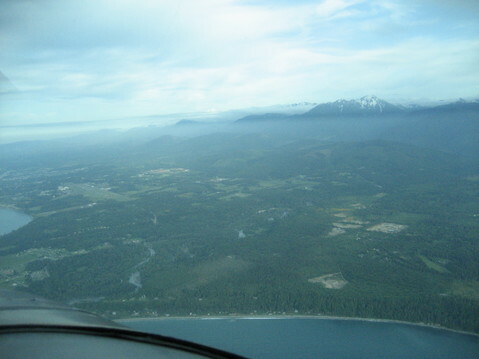 The only problem is that the airport is tucked into the upper Stillaguamish valley. The mountains largely block VHF signals to any population areas except, perhaps, Victoria, B.C. The 30-40 minutes it takes to fly to Darrington (or the other public-use airport in nearby Concrete, WA) are better spent driving to one of the schools in Granite Falls and settle for a 400′ location. Granite Falls has some obstructions, but is still far more productive than Darrington. Weather: it doesn’t always cooperate, and the forecasts are frequently off in this region. In 2011, the weather seriously changed my plans. I was able to adapt, but not as quickly as I might have done with some advanced planning. Propagation: plan as if the bands will be dead, but be ready to change if there is a band opening. In 2011, there was a nice 6 meter opening. I did get in on it, but could have squeezed more out of the opening with a little advance contingency planning. Locations: Plan for alternative nearby roving locations when roving out of the car. Stuff happens, and searching on the fly is very inefficient. One very useful way of doing this is using Google Maps My Maps to mark, label, and describe roving spots on a desktop computer. The My Maps locations can then be pulled up on an Android phone, and one can ask for turn-by-turn guidance to the spot. It works very well…provided you have cell phone data coverage along the route. 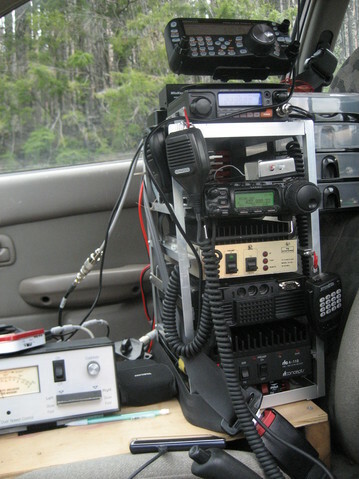 Equipment: My 2012 June VHF QSO Party station included more equipment and power. Last year I simply used a Yaesu FT-857 on 6 and 2 meters, with a couple of bonus QSOs on 432. For 2012, I went to four bands and multiple radios. A Kenwood TS-480SAT augmented by a TE Systems 0510G amplifier gave me 170 watts on 6 meters. The FT-857 was aided by an RM Italy KL-145 amplifier for 200 watts PEP on 2 meters and an RF Concepts RFC4-110 for 100 watts on 432 MHz. Finally, a Jetstream JT220M provided 50 watts FM on 223.5 MHz. Accessories included a Winkeyer USB with a W5JH portable paddle. And to top it all off, I added a N8XJK Super Booster to the mix a few days before the start of the contest. For the car, I used a second automobile battery in parallel with the stock car battery. Out of the plane, I used the same battery stand-alone. A charger that plugs into the airplanes’s cigarette lighter outlet was used to charge the battery while in flight. Radio equipment plugged into a home-built 10-port Anderson Powerpole power distribution box. The rack was made entirely out of angle aluminum and held together with stove bolts. Here is the rack ready for action in the airplane. 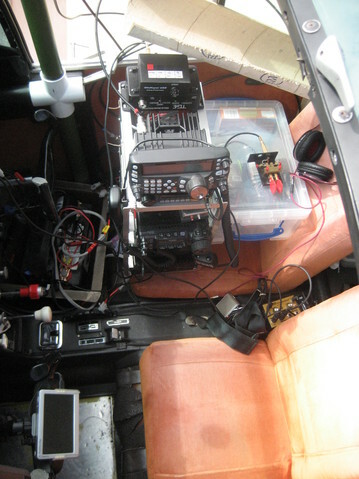 With the rack, moving between car and plane involves unplugging power and three coax connectors, and then moving the battery onto the front passenger floor of the vehicle, and moving the rack to the passenger seat. During flight or while driving, the rack is secured with a seat belt and shoulder harness. 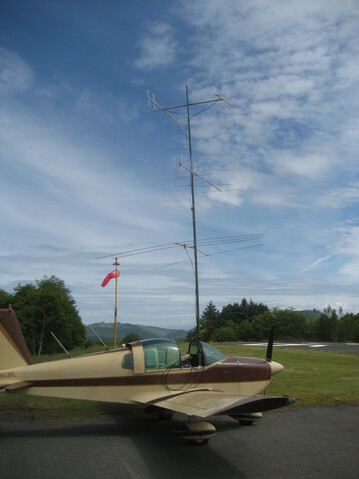 Antennas: In 2011, I had a single set of antennas that I used out of the car and plane. It consisted of quagis for 432 MHz (11 elements) and 2 meters (5 elements) and a three element yagi for 6 meters. The 2 and 6 meter antennas had a 2-piece boom and removable elements. Over the year, I improved the design to include a hinge in the center of the boom, quicker release of the elements and so on. 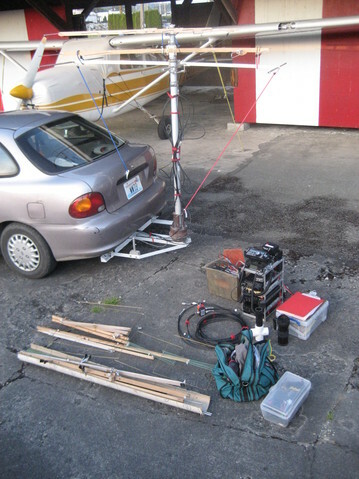 For 2012, I used different antennas for the car and for the plane. The airplane set-up was pretty similar. I re-used the 2 meters and 223.5 MHz antennas from earlier contests. 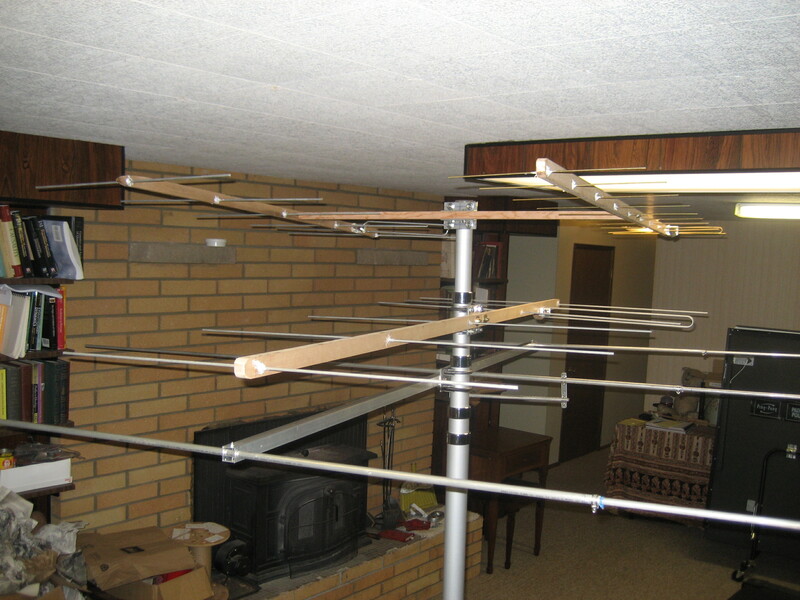 But I built an 11-element 432 MHz half-folded dipole yagis using the WA5VJB recipe. The original reason for using quagis is that they provide a no-fiddling-around 50 ohm match. But the WA5VJB antennas do the same thing with less awkward elements. I’ll convert the 2 meter and 223.5 MHz antennas to half-folded dipole yagis for future contests. For six meters, the antenna began as a 3-element gamma matched yagi in June 2011, but the gamma match was too difficult to set up quickly and repeatably. So, for the 2011 CQ VHF contest, I fed it as a straight dipole, made it 4-elements, and used an LDG Z-100plus antenna tuner. Not ideal, but easier to set-up than the gamma-match version. For 2012, with the addition of an amplifier, I needed a good match without a tuner. So, I fired up 4NEC2 and designed the driven element as a half folded dipole yagi at 50 ohms. It was converted back to a 3-element design because the gain is very similar but set-up is a bit faster and the antenna is lighter. I undertook the surgery a few days before the contest. Fortunately, theory matched practice, and a very nice portable 6 meter 3-element yagi was the result. 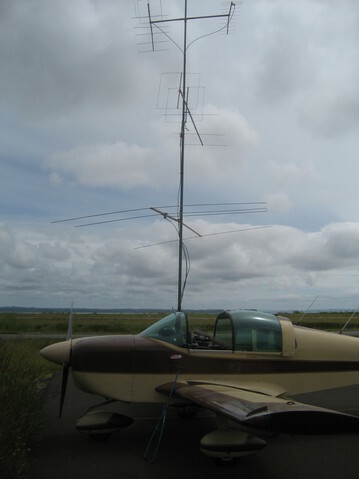 The antennas are mounted on a 31′ Jackkite fiberglass mast with sections removed to keep it at 20′ AGL (the legal limit for an un-permitted antenna at an airport—47 CFR 17.14). LMR 240 coax fed the antennas. A series of improvements to this set-up resulted from participating in the Spring VHF Sprints. For QSOs in motion, I ditched the halo antenna used in previous contests. It didn’t match very well in proximity to all the other antennas without a tuner. I whipped up a 1/4 wave whip antenna for six meters, and mounted it off the front of the car on a ball mount. 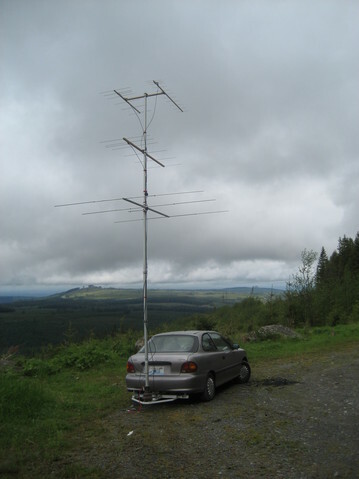 A magnet mount 2 meter/432 MHz whip sat on top of the car. In practice, the mast-mounted beams for 144, 223.5 and 432 MHz tended to work better while in motion. Antenna switches allowed me to find the best antenna for the situation. Schedule: Weeks before the contest, the roving plan included part of each day in the plane and part in the car. If all went well, I’d hit 12 grids. But the week of the contest showed marginal VFR flying weather for Saturday. The scheduled was reorganized. This schedule carried me from one super grid corner (CN96/CN97/CN86/CN87) beginning on a 3200′ ridge near Mt. Rainier to another so-so corner (CN97/CN98/CN87/CN88). The Redmond stops for CN97 and CN87 were new locations being tried for the first time this contest. The final grid, in CN87 is my backyard. The 2.5 hours scheduled there served largely as a buffer in the (probable) event I fell behind the schedule. The first three Sunday grids are on the Olympic Peninsula. The Ocean Shores airport parking ramp has a line of latitude running through it, and is 125 meters across—enough to legally activate two grids, since the rules require a minimum of 100 meters move when going from one grid to another. CN77 is in the top ten of “most wanted” grids—it’s tied for fifth in a 2010 survey. CN78 is somewhat rare, as well. The last three grids are in eastern Washington and require weather suitable for crossing the Cascade Mountains. What was dropped from the original “ideal weather” schedule was an airport in CN85 (Portland, Oregon), but I couldn’t reasonably fit it in without cutting off the three eastern Washington airports. The revised schedule was designed for “hit and run” operations, with 40 minutes of stationary operating time in each grid. It was designed to maximize the number of contacts, grids activated, and local grids contacted under poor propagation conditions (i.e. no band openings). In the event of a band opening (where many QSOs are to new grids), I would trade off activating grids for spending more operating time in each grid. Saturday: The day started out pretty much as planned. I found myself in the unusual situation of arriving in CN96 early, getting set-up and even having 20 minutes to kill before the start of the contest. The only thing that wasn’t working very well was my APRS station. It is based on the TinyTrakIII kit that is susceptible to RF overload. I ended up with a couple of blips from the car before it went into perpetual reset mode. In the airplane, it worked very well, however. CN96, Carbanado, WA: At 18:00 UTC, the bands came alive. At 18:45 (5 minutes over the scheduled time) I had worked 10 stations and 4 grids on 6 meters, 12 stations and 5 grids on 2 meters, 3 stations in 1 grid on 223.5 MHz and 2 stations in 1 grid on 432 MHz. It was disappointing to only work one Oregon station, because the location offers good paths into Portland. Oddly, I had twice as many B.C. stations despite a somewhat blocked path in that direction. CN86, Carbanado, WA: About 2000′ down the road (and 400′ lower in elevation), I set up in CN86, and things picked up. This time I went 10 minutes over my 40 minutes allocated for the grid, so I was a total of 15 minutes behind. Combined with a couple of in-motion QSOs, I managed 17 QSOs and 7 grids on 6 meters, 14 QSOs and 6 grids on 2 meters, 4 QSOs and 2 grids on 223.5 MHz and 9 QSOs and 3 grids on 432 MHz. Five QSOs with three stations were in Oregon. I made a clean sweep of the bands with VE7JH/R in CN78. CN97, Redmond, WA: The next stop was CN97 about an hour away. This was a new-to-me roving spot in my home town of Redmond. I picked up a bunch of CN87 QSOs on the drive there. Everything was ready to go at 22:18 UTC, just 18 minutes off schedule. Conditions were good, but no noticeable propagation outside the region. After a bit more than an hour, I had worked 24 stations in 6 grids on 6 meters, 14 stations in 3 grids on 2 meters, 6 stations in 3 grids in 223 MHz and 3 stations in two grids on 432. I ended up working a couple more 2 meter and one 223.5 MHz QSO in motion later on. 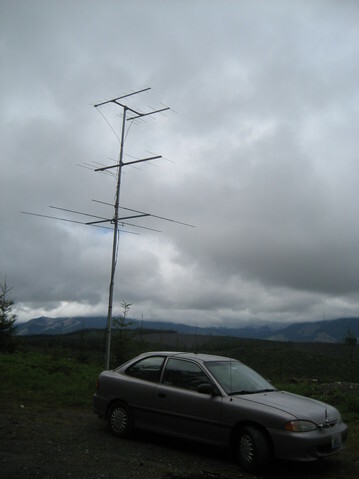 CN87, Redmond, WA: Two miles away, was CN87 at 600′ in the driveway of Grant, KZ1W (thanks Grant!). I was 45 minutes behind schedule, but could save time here because I had already made 15 QSOs in the grid and would likely make more in transit and in the evening out of my back yard. By the end of the contest the CN87 count was 13 QSOs for 3 grids on 6 meters, 6 QSOs in 3 grids on 2 meters and 432 MHz and 6 QSOs for 2 grids on 223.5 MHz. I left Grant’s house after 30 minutes. CN98, Granite Falls, WA: At this point, I switched the order of my next two destinations in CN88 and CN98. It was a graduation weekend at many high schools, so I wanted to avoid showing up in the middle of a school event in CN88 (Lake Stevens High School). I arrived at Mountain View Elementary School in CN98 at 01:57 UTC, about a hour behind schedule. This grid wasn’t overly productive. First, there are mountains on two sides and rising terrain on a third side. But the traffic was down overall, as people were stopping for the evening to eat dinner. I managed 10 QSOs for 5 grids on 6 meters, 8 QSOs for 3 grids on 2 meters, 2 QSOs for 1 grid on 223.5 MHz and 4 QSOs for 2 grids on 432 MHz. CN88: Lake Stevens, WA: And I was off to Lake Stevens High School, CN88, hoping some folks would return to the airwaves after dinner. I arrived at 03:15 UTC, about a hour behind schedule. While driving up the hill to the high school, I noticed a high noise level on 6 meters. In the middle of things, I had a QSO with KA7RRA/R, who was nearby. He and a friend stopped by to chat at the tail end of their day of roving. It was fun swapping roving war stories. Back at it, I was still struggling with, what appears to be, power line noise on 6 meters. Then, out of nowhere, I worked K5AM in DM54. It didn’t really sink in that there was some kind of opening on 6 meters, as DM54 is in Arizona. I probably should have been tuning off the calling frequency for other stations, but I didn’t. And the last few stations were local. I left after an hour and a half. Including a few mobile QSOs, I managed from CN88 9 QSOs and 4 grids on 6 meters, 12 QSOs in 5 grids for 2 meters, one QSO on 223.5 MHz and 3 QSOs for 3 grids on 432 MHz. It was almost 11 pm local time when I got home, and rather than setting up in my back yard, I called it a day—an even bigger day was ahead…. Sunday: Day 2 started at 6 am local time with a quick shower and a run to Harvey field in Snohomish, WA. 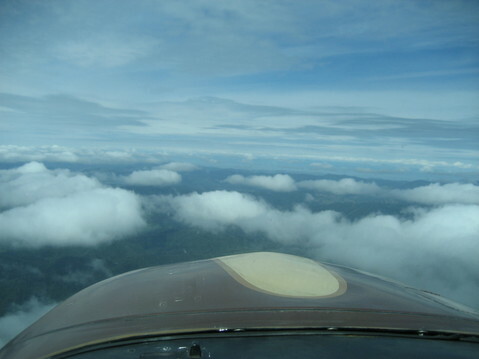 The weather was marginal for VFR flight, but it looked to be clearing. I took my time with the install and preping the plane, leaving the ground about 45 minutes behind schedule. Even then, the clouds were barely at 1800′ AGL, forcing me to cross the Puget Sound at a much lower altitude than I prefer. Over Silverdale, WA, I ran into a wall of clouds cascading off of the Olympic mountains, and even lower clouds everywhere. It looked a little better to the south, but not much. I headed in that direction, wandering around trying to find clouds high enough for me to legally fly under—the airspace requires me to be at least 500′ below the clouds and no closer than 500′ to buildings and people in this rural area. It took a bit of meandering, but I finally found a path. CN76, Ocean Shores, WA: I had scheduled to be on the air by 16:00 UTC. The first contact from CN76 was at 17:01 UTC on 432 MHz with N7NW (Jim, N7ND, was at the mic). I had left blank log sheets back in the car, so the back sides of the previous day’s log sheets were employed to log the day’s activities. The 6 meter calling frequency was very busy. Hmmm…I spun the knob down to the CW portion of the band and found some CW activity. I quickly worked W4IT in EM84 (I didn’t realize at the time this is South Carolina! ), N0RE in DM69 (Colorado) and N7NW in CN87 (probably Hal this time, but I didn’t ask). After running the bands for a few locals, I started “exploring” the 6 meter opening some more. It was incredible. This was no time to rush off activating grids, as every other QSO was a newly contacted grid. Given my late start and the wonderful opening on 6 meters, I decided to scratch the last three stops on my literary, and stick to grids in the CN7x series. After an hour and a half in CN76 I had made 27 QSOs in 19 grids on 6 meters, and 8 more QSOs on the other bands (CN87 only). About 1/3 of the QSOs were CW. CN77 didn’t disappoint. It seemed the entire continental U.S. was booming in. At this point, I probably should have hopped over to the Hoquiam airport, about ten miles away and in CN86. That move might have maximized QSOs and, perhaps, brought in some new grids. I could refuel there, so that I wouldn’t have to throttle back to keep a healthy fuel reserve (as I had to do for the remainder of the trip). The down side of that strategy is that I’ve worked out of Hoquiam a couple of times, and found it utterly unproductive. On the other hand, it is certainly possible the location would work fine for an opening like this. I wouldn’t even have to set up the upper three bands, as I had already activated CN86 the day before. Also, after many hours of operating out of Ocean Shores, I wasn’t sure how much juice was left in the battery, and recharging for 10 minutes for the hop to Hoquiam wasn’t going to do much. In any case, I really wanted to go to Sekiu to activate CN78. I caught a chunk of the 6 meter opening during last year’s June contest from that location and felt like I was on top of the world. So I packed up the plane and headed into an unknown weather situation. 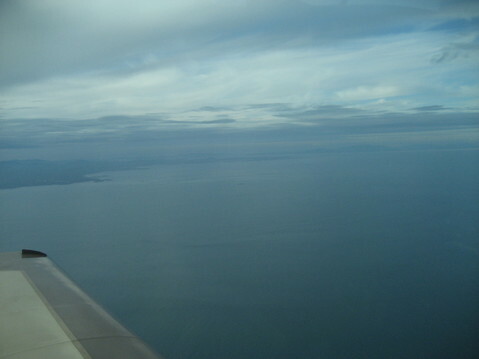 The 50 minute flight was uneventful, and I found plenty of open skies at the other end. CN78, Sekiu, WA: I don’t know why it took me two hours from my last CN77 QSO to my first CN78 QSO, but it did. I was slow getting set-up and not too sharp–I had to re-do some things a couple of times to get them right. I needed to stretch. I ate food. The one thing I did right this time was to create a 6 meter dup sheet—should have done that for CN76 and CN77. When I finally got on the air at 22:10 UTC, 6 meters was still very much alive. I rode it out until the band began to fade sometime before 01:30 UTC. After that, my CQs on 6 meters phone and CW went unanswered until the N8XJK power booster started complaining about a low battery. I switched over to the higher bands and switched off the amplifiers. I did manage to work a couple of Puget Sound area stations on 2 meters. I was entirely unsuccessful on 223.5 MHz and 432 MHz. I shutdown with an hour remaining in the contest. CN78 was fairly productive, with 49 QSO into 33 grids on 6 meters and 7 QSOs into CN87 on 2-meters. About half the QSOs on 6 meters were CW. and Vancouver Island is off the left wing…. Score: Scoring is the tough part; it requires careful entry of the paper log sheets into a spreadsheet. Not counting the ten duplicates found, the QSO counts were 210 on 6 meter, 90 on 2 meters, 26 on 223.5 MHz, and 32 on 432 MHz. For grids, six meters was highly productive, yielding 69. Two meters was a distant second with 9 grids; 222 MHz and 432 MHz provided 4 and 5 grids, respectively. The final claimed score was computed as 416 points (not counting those duplicates) multiplied by the 87 grids contacted and 9 grids activated, for a total of 39,936. I had contacts in 19 states, as well as Canada and Mexico. Conclusions: Even with this years’s more complicated equipment set-up (three rigs, three amplifiers, keyer, power booster, antenna rotor) and multiple antennas (four in the airplane and six on the car), everything really came together quite well. Best of all, the gods of propagation smiled upon the contesters this year making the 2012 ARRL June VHF QSO Party wildly fun!